Gold Flower : Are you fond of shooting games? 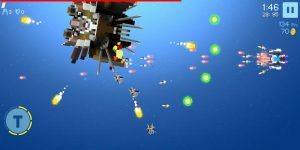 Then enjoy this simple yet exciting shoot’em up game. All you need is to choose one of various spaceships, enhance it and beat off numerous invaders in the galaxy. Gold Flower – Bullet Hell Space Shooter is an arcade shooter game in pixel graphics, where you can enjoy both danmaku and shooting. The rules are simple: Avoid the bullets and shoot down the enemies. Their fancy and various barrage would stimulate your competitive spirit! Dozens of space invaders and hundreds of fancy danmaku are prepared just for you, waiting for your challenge. New stages are updated every time the shooter’s challenge becomes fierce. Then what are you waiting for? Jump into this exciting space battle right away! Move your spaceship by sliding and touching the screen and double-tap to rotate your direction! Attack and destroy the drones! The boss flies away after certain time! Equip the Turbo Pack and enable a powerful turbo mode! Equip Shield and Jewels to dodge from the enemies’ space attacks. You can play without network connection. Google Play Achievements and Leaderboards are also available. Shooting is So cool ! The Galaxy’s future is now in your hands. Download Gold Flower Today Its Free! Thanks for the new graphic. Because it’s made me to delete this game soon from my phone. Awesome! Without turning, i can’t attack the boss easy.